I am having so much fun with this blog! (I hope you all are enjoying it too. Please keep on liking and leave a comment if you want to). This is a GIANT food haul, but when all the summer fruit is coming into season and there are watermelons, litchis, and mangos to be had, it’s NO time to be moderate. I’m sure you will agree. 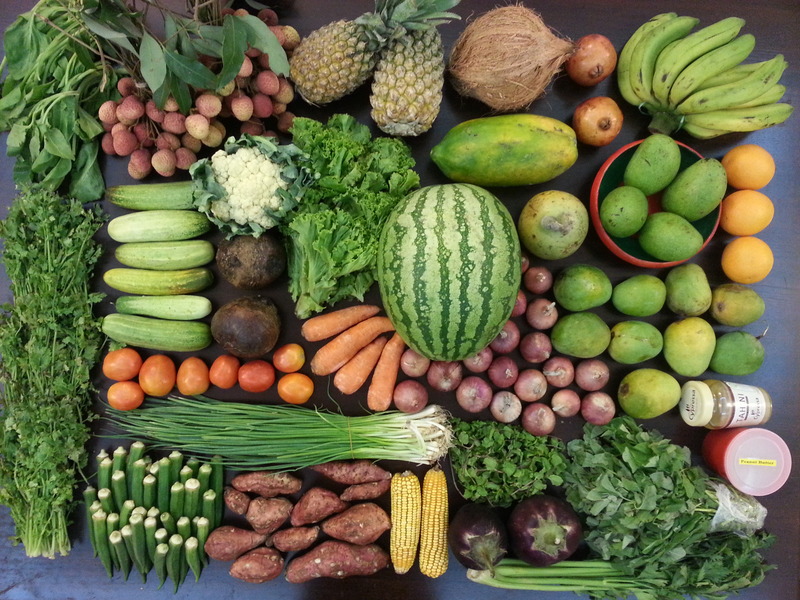 Spinach, coriander, litchi, cucumber, tomato, spring onion, ladies finger/okra, cauliflower, beet, sweet potato, pineapple, green leaf lettuce, carrot, corn, coconut, pomegranate, papaya, wood apple, red onion, mint, aubergine, celery leaf, banana, green mango, orange, himsagor mango, amaranth leaves, tahini, and peanut butter. The corn was a surprise. I didn’t order it. I don’t think corn is a local crop, so it must have been imported and not finding high demand. It was a “gift” that came with the rest of my order. I’m not a huge fan of corn, actually. I’ll eat it if someone is serving it, to be polite. I don’t dislike it, the color is pretty, but I never never think, “Hm… what sounds good? Corn! I gotta get me some!” Never. I’m feeling a little challenged to put these two ears of free corn to use now, just because I hate wasting food. I’ll think of something. I most likely will not eat all the red onion within this week, and maybe the coconut will go on into next week, too. We’ll see. But otherwise, yup it’s just me and food for the coming week. I do have some brown rice, quinoa, nuts, flaxseed, chia seeds, nutritional yeast, and dry legumes like garbanzos and dal in my cupboard as well, but the fruits and veg are definitely the bulk of what I eat everyday. Some healthy plant-based fats, too – tahini and peanut butter. Gotta have it ’cause it’s delicious, but also for better nutrient absorption. Eat healthy fats! I get my groceries delivered – I think I’ve mentioned that before – which is nice for me saving me a lot of time and hefting very heavy produce all over Dhaka. Bonus, it also means I have more time to play color-blocking designs with it all on my table, which I clearly enjoy doing. Do you like my designs? I find that taking pictures of my food hauls makes me mindful and appreciative. It’s gratifying to see all the colors and abundance. I’ve eaten this way for many years, but I know not everyone wants to hear about it or considers this to be “real” food. So I tried to keep it down. But food is such a big part of all our lives, why shouldn’t I get to enjoy and share, too? There are not many vegans around me, so discovering the online vegan community has been a real treat. It’s very affirming and pleasing to share what gets me excited about food and see videos and recipes that I can take inspiration from and not have to skip or ignore the animal products, make adjustments, or veganize. I hope that through these posts that I am also contributing and community building or enhancing as well. Great stuff. Looks like you’ve taken a break from blogging. I just started following you, so please resume the blog!